So we teased last week, and the day is finally here! The day you get to gaze (virtually) upon the full monty of Lord Expedit. So here’s how he looks from the doorway to the kitchen. Tall, dark and handsome! Here’s how he looks from the dining area. And that’s his friend on the other wall, our Coat Cubby, topped with my sea glass collection. The yellow column is, as you already know, the bar zone of the bookcase. There you’ll find all things adult-beverage related in one handy spot. We went with the left end as it is also handy to the dining corner, making that last-second grab for wine extra convenient. The blue section is the main library zone of the bookcase. We do have another bookcase with more books, but this one houses our fun or conversation-starter type books. And yes, they’re largely organized by color. The green end is the… well…other storage section? And finally, along the top we have the white zone. There I’ve started a gallery of sorts. You’ll learn more about that later this week. I love mixing tchotchkies and picture frames on a bookshelf to break up the books and to also add some personal character to your space. There are a number of fantastic photos proudly displayed on Lord Expedit, including the one you saw above in the green zone. It’s a black and white print of ‘the guys’, or Bill and his buddies from our very first New Years together. This little guy is just shy of 3 inches tall on the bookshelf, but is of course one of the tallest iconic buildings in DC where Bill & I met. I took it during one of our visits to the Cherry Blossom Festival. This little girl is my adorable and newest niece! She was born while I was traveling abroad in Southern England and Paris. I took this photo of her during my first visit to see her. Speaking of babies abroad, these final two photos are also from my trip. One being from my favorite site we saw, the Eiffel Tower. The first above (not so subtly placed in front of a red phone booth) is a tiny wallet sized shot of myself with two of my oldest friends. On the far left is Molly, who traveled with me while center is Brynn, who we visited and who was at the time expecting her first little girl. She’s since become a mommy to beautiful little Scarlett and they’re doing wonderful. 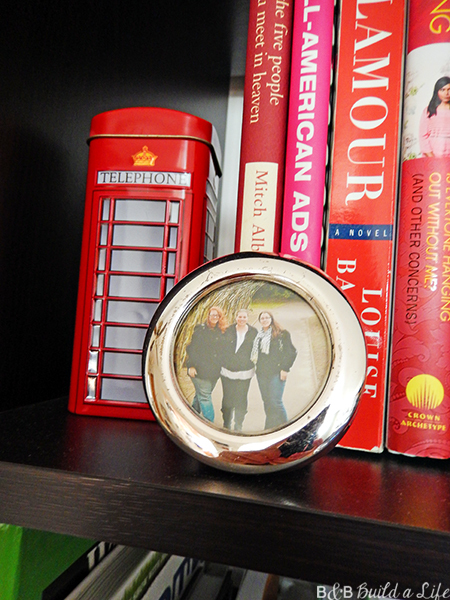 As for tchotchke usage, I like to use a mix of both personal items as well as some more background items. The personal items are things like the Bobcat bobble-head doll, or the Penn State and Quinnipiac hockey pucks on the white shelf. The ‘background’ items are things I included that don’t really hold a lot of memories or personal value but that add more character without detracting from the rest of the display. I do this by selecting items that are uniform in some way. In this case I chose items that were white or silver. White was to blend with the the tray and the two picture frames (on the bar, and hanging on the shelf itself) while silver was to also go with the other frames. I pulled a fresh green looking plant and plopped it into a crisp white IKEA planter, and added the white ampersand and trophy urn before using the silver shell as a bookend. So there are some juicy tidbits on my chaotic decorating methods and a tall dark and handsome gent we like to call Lord Expedit. 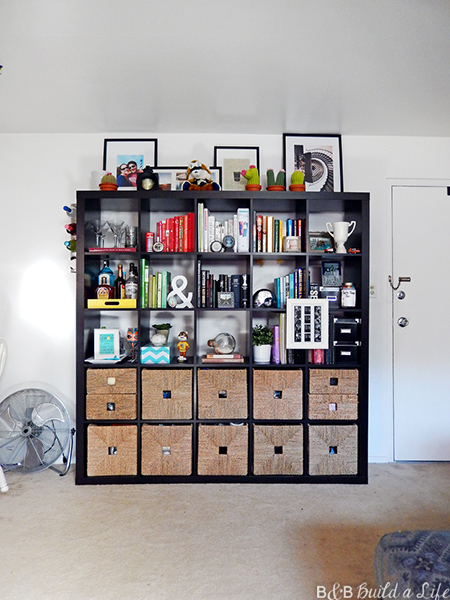 It looks great – when we build our bookshelves, I will need you to come over!